From Nightwood to The Bedford, diners can nibble on the best of breakfast for dessert. Fortunately for the morning crowd, gourmet doughnuts are making their debut in stand-alone shops across the city. Doughnut Vault (401 1/2 North Franklin) is a tiny, tiny bakery tucked away behind the Merchandise Mart. Tasty bits of fried dough are served five days a week from opening to “whenever we run out.” Experience has taught me that means “get there when they open.” But for a chance at the chestnut glazed doughnut or a stack of gingerbread cake doughnuts, I certainly don’t mind the early start. Heavenly confections can be yours for $2-$3 dollars. Coffee is $1. 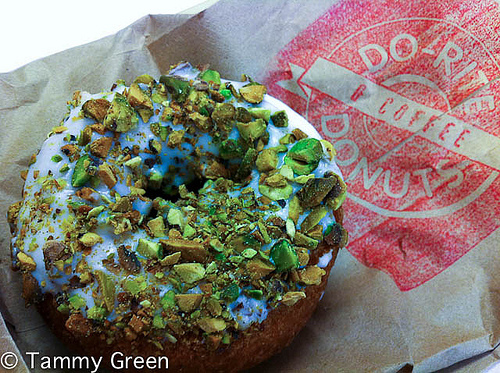 Located in the midst of the theater district, Do-Rite Donuts (50 W Randolph) is run by former L2O chef Francis Brennan. Brennan is responsible for whipping up dreamy flavors like Maple & Candied Bacon cruller as well as Peanut Butter & Jelly Bullseyes and a gluten free cinnamon sugar option. The pistachio crusted cake doughnut with a meyer lemon glaze is my current obsession, and I will gladly shell out $3 to get my fix. 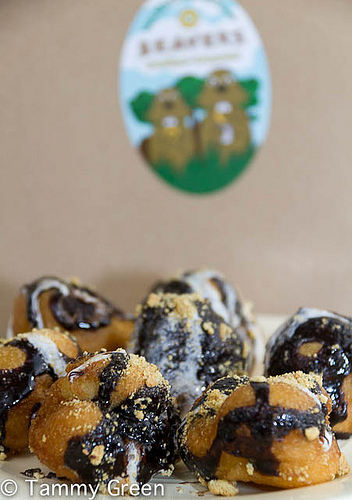 Beavers Donuts currently runs the only food truck in Chicago serving up mini-doughnuts and coffee. I always hope to burn a few calories chasing these guys around the city, but they made it too easy find them via Twitter. If you have a hard time choosing between the temptation of S’mores and Nutella Dream gourmet flavors, don’t worry, they let you mix and match a dozen for $8. 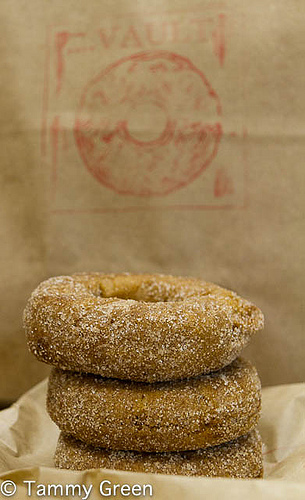 Or, if you’re a busy beaver, pick up three cinnamon sugar donuts and cup of coffee for $4. If you’re in the mood for doughnuts, these spots are certainly a reason to look beyond the local coffee shop! This entry was posted in Dining and tagged Beavers Donuts, Do-Rite Donuts, Doughnut Vault, Francis Brennan, L2O, Nightwood, The Bedford. Bookmark the permalink.